A golf trick-shot artist, a challenge for John Daly, invasion of the LPGA and a training aid review. Trick-shot artist Tony Musto, a.k.a. Deuce Mulligan, shares his golf teaching methods on our latest Golf for Beginners Podcast. The gauntlet is thrown down at John Daly's knees. Will he respond? The LPGA moves into PGA territory. Will the men move over? We review an inexpensive balance training aid. And we pull a "love" letter out of our email bag. Please direct your questions and comments to golfforbeginners@aol.com. You can subscribe to our weekly podcast through iTunes by clicking here or download our weekly feed at http://feeds.feedburner.com/golfforbeginners. Press Releases Issued! New Golf Podcast Released with Updates! Our Golf for Beginners Podcast has been updated. The press releases which we have been waiting for have finally been sent out and our news is BIG! Please download the latest Golf for Beginners Podcast (above) to receive our news! Also, check out my our golf blog located at Worldgolf.com. We hope to have all of our files transferred soon and then we will redirect you to the new site. A "mind-bending" podcast, a great training aid rediscovered and love (?) on the golf course. On our latest Golf for Beginners podcast we talk with sports hypnotist/mind coach Pete Solana at the Lower Hudson Valley/Journal News PGA Golf Show. His great mental game tips will help you whether or not you believe in the power of hypnosis. The "impact bag" is our training aid selection of the week. We talk about the importance of the "moment of impact" and how to use the bag properly for best results. With the tours all being in "full swing", Barry and I touch on Tiger Woods and the PGA Tour and Annika Sorenstam, the number-one golfer of the LPGA tour. With the Kraft Nabisco Championship as the first major tournament of 2006 I give my prediction on who will win and how contenders like Natalie Gulbis and Paula Creamer will fare this season. And with the dating market expanding rapidly through the internet Barry and I talk about he latest craze of having your first date on a golf course after visiting golfmates.com. Naturally we disagree, but what did you expect? Send your comments to golfforbeginners@aol.com. Our podcast can also be downloaded directly through iTunes. Okay, so it was not only FREEZING, it was windy and rainy too! But the elements couldn't stop us from playing golf in Myrtle Beach! Download our latest Golf for Beginners Myrtle Beach Podcast and listen to our adventures first-hand from our comfortable ride on Spirit Airlines' upgraded service to our not-so-comfortable golf experiences at Meadowlands Golf Club in Calabash, NC (just a hop, skip and a jump from Myrtle Beach), the infamous Tidewater Golf Club and finally, Myrtlewood Palmetto Golf Course. But it's not all about golf in Myrtle Beach. Experience the ambiance from our perspective. Entertainment, restaurants and nightlife are all featured in this week's show. For now, let's discuss how to play "happy golf", even when it rains on your Myrtle Beach vacation! This may sound easy enough to accomplish, but I assure you it is one of the hardest lessons that I’ve set out to achieve this season. Two simple words, “play” and “happy” were taught to me as soon as I could enter a sandbox but it appears that I have forgotten the true meaning behind them. Allow me to explain. Winds were whipping, rain fell heavily and it was bone-chilling cold last week in Myrtle Beach. Temperatures rarely rose above 50 degrees. With the lack of sunlight and clothing that I brought for spring-like conditions my focus dwindled with every passing hole at both Meadowlands and Tidewater Golf Clubs. Although I tried to smile, my teeth were chattering. Every time the rain intensified my facial muscles contracted and my back tightened. Driving along in the cart made me shiver. Even though Barry kept his arm tightly around my shoulders it was a never-ending battle between myself and the elements. My smile turned upside down and stayed in that position throughout most of my much-needed golf vacation. This hurt my game. As a matter of fact, I really didn’t have a game this past week. I can’t blame this on the elements, only on my inability to keep those two words as my mental focus. Seems like an easy enough concept to grasp, right? Last night I watched the Champions Tour AT&T Classic and although the conditions were similar to the ones I encountered the outcome was amazingly different. It wasn’t just a few more layers of clothing that separated me from Tom Kite but it was also his tremendous ability to block out what he couldn’t control and concentrate solely on the task at hand. Kite didn’t fall apart, I did. That made me think about my goal this season, that is, the ability to “let a smile be my umbrella". Tom Kite laughed at the gloominess even though he was clearly uncomfortable. He didn’t let the elements get to him. He didn’t let the slick grips of his clubs or his less-than-perfect shots faze him. He merely shook it all off and calmly made his way through the course. I’ve seen Tiger Woods among the guilty too. He occasionally curses and throws a club or two (and on national television too!) but he has a short memory. Phil Mickelson, after missing one of those nefarious three-footers for par, pastes a blatantly fake smile in his attempt to regain his composure and forget what happened only seconds earlier. Although Lefty’s fans know that his smile is not a genuine attempt at forgetting his bad play, we sympathize with him until he gets back on track. Perhaps the illusion of happiness is all we need to change our disposition? Whether you’re a novice like myself or if you have been playing golf for years, the ability to conquer anger during a round affects us all. Everyone hits bads shots. Golf is a game of recovery. Those that learn this confidently smile in the face of adversity. I have dedicated this season to learning how to play happier, how not to allow annoyances such as fat shots on a meticulously manicured fairway or thin shot out of a wet sand trap ruin an entire round of golf. It’s going to be a difficult lesson to re-learn even though its the single idea that can turn a beginner like me into a real “player". Direct all comments and questions to golfforbeginners@aol.com. You could hear your remarks on our next podcast! Getting Personal With Tiger Woods. Where's Elin? In this week's Golf for Beginners Podcast Seventeen Barry and I talk about Tiger Woods and Phil Mickelson's 2005 showdown at Doral's Blue Monster and the possibilities of another exciting finish this year at the Ford Championship. A dramatic ending usually occurs here at the 18th hole. Also, learn a little more about Tiger Woods this week. What's his favorite movie? How does he like to spend his time? How does his wife, Elin, fit into his plans? In honor of this weekend's 78th Academy Awards we discuss how the LPGA has moved into the mainstream by inclusion into this year's celebrity giftbags. Listen to the podcast and hear how the ladies gain their own celebrity status. Among the female golfers involved are Paula Creamer, Natalie Gulbis and Christina Kim. As new LPGA Commissioner Carolyn Bivens stated, "the LPGA is one of the hottest sports properties in the world right now, and the LPGA gift is a unique offering that stands out from the spa packages, electronics and hotel trips that are traditionally included. Our product is our players, and what better way for A-list Hollywood celebrities to experience the LPGA than at a tournament and through a golf lesson with one of our stars." With new and exciting ideas like this one, it won't be long before the LPGA gains celebrity status of their own! Being included in a $100,000 celebrity gift basket will make the golfers more recognizable to top executives, which could open up a whole world of advertising for the LPGA. This would make the ladies more accepted in an entirely new arena outside of basic cable and perhaps, in time, start the snowball effect of placing the ladies into mainstream media. It won't happen overnight but they're certainly moving in the right direction. To see some of the items included in this year's Oscar Celebrity Gift Bag, visit the Sun Times. Our Blogger Weekly section is back with the "Battle of Medway" and Cosmonauts hitting golf balls in space. And mediaguru from hookedongolfblog.com asks John Daly to stop singing…frankly we don't agree. Barry and I finish up with some great golf tips that are easy to both practice and remember. Feel free to send your golf-related comments and questions to golfforbeginners@aol.com. You can listen to this podcast through iTunes by clicking here. If we select your comment we'll give you a little celebrity status of your own by answering your query on the air. Thanks for listening every week and remember, play good golf! Can Mickelson Survive Another Duel against Tiger Woods at Doral? In honor of this week's high profile Ford Championship at Doral, all other tours call it quits for the week. Tiger Woods versus Phil Mickelson again? Wouldn't THAT be a good ratings boost for NBC! Especially since the recent Olympics were a ratings flop for the station. We can only hope that NBC doesn't cut away in the middle of the event as other channels have done (ahem, CBS), usually for issues that could have waited until the nightly news! With all of the major players coming out for this battle with the Blue Monster, expect a weekend of dueling sticks and all of the makings of a tournament that will be featured on golf forums for weeks to come! Defending champion Tiger Woods is hoping to make this his third victory of 2006. Phil Mickelson, the king of drama, will try to stop him in his tracks once again even though Lefty's record against Tiger proves that he will have a tough time of it. The last three tournaments playing against Woods, Phil was trounced. At this same time last year Phil already had two victories under his belt, during the West Coast Swing. With four top-ten finishes so far this season but no victories its time for Mickelson to wake up and get busy before the season slips away from him, sort of like the 2004 season when Phil coasted without a single win. Perhaps Mickelson will play better golf at the Southern Swing events. This is the first stroke-play event of 2006 where all the top players are in the field. 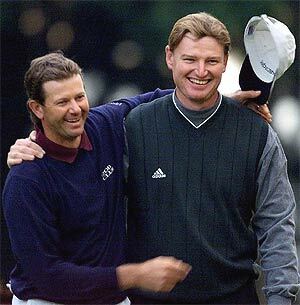 Retief Goosen and Ernie Els enjoy playing golf together and are good friends off the course. Ernie Els, Vijay Singh and Retief Goosen haven't really done anything memorable during this 2006 season except for the recently when Singh forced officials to review Lefty's driver. Singh has the same number of top-tens as Mickelson and both Els and Phil slipped in the World Rankings. If Tiger keeps his game to the same exacting standards as of late, another win may well be on the agenda. Tiger may also want to do something really special this year as it is his tenth year since both turning professional and joining the PGA Tour. Perhaps winning all four majors in a single season might do it! But then what would be next for Tiger? Kids, diapers and a 7-passenger Caravan? Notables in the field include Craig Parry who won the 2004 Doral with a spectacular eagle from the fairway. Who can forget that shot! Nick Faldo has been elusive on the PGA Tour but will try to win a second time since his 1995 appearance. Maybe Faldo, who is now a commentator, will give us a blow-by-blow description of the tournament from the trenches! The 7,266-yard course at Doral will certainly favor the longer hitters this week, but the twelve holes surrounded by water also makes the golfers step into this course with trepidation. At this venue it is usually the 18th hole that decides the winner. Speaking sentimentally about Doral for a moment, this is the final season that the Blue Course will host this particular stop on the East Coast Swing. Instead Doral will be a featured course on the 2007 PGA Tour as a host for the World Golf Championships.